UK Foreign Office minister Baroness Sayeeda Warsi has resigned from government, saying she can "no longer support" its policy on Gaza. She told her Twitter followers that she was leaving with "deep regret". She was previously chairman of the Conservative Party. 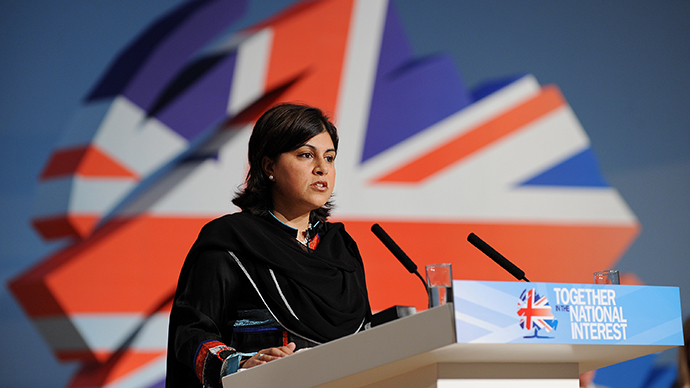 Lady Warsi became the first female Muslim cabinet minister when David Cameron took office in 2010. She was demoted from the cabinet to a middle-ranking FCO post in 2012 and became minister for faith and communities at the same time. She tweeted on Tuesday morning: "With deep regret I have this morning written to the Prime Minister & tendered my resignation. I can no longer support Govt policy on #Gaza." She grew up in Dewsbury, West Yorkshire, as one of five daughters of Pakistani immigrants. After studying at Leeds University she later worked for the Crown Prosecution Service before setting up her own legal practice. In her resignation later she said the government's current stance on Gaza is "morally indefensible, is not in Britain's national interest and will have a long term effect on our reputation internationally and domestically". Lady Warsi also claimed there is "great unease" in the Foreign Office over "the way recent decisions are being made". A Downing Street spokesman said: "The PM regrets that Baroness Warsi has decided to stand down and is grateful for the excellent work that she has done both as a minister and in opposition. Chancellor George Osborne, however, called the resignation "disappointing and frankly unnecessary". Speaking on LBC Radio, London Mayor Boris Johnson, said he had "great respect" for Lady Warsi, and hoped "she will be back as soon as possible." Israel launched Operation Protective Edge on 8 July, which to date has killed 1,800 Palestinians and 67 Israelis causing outcry across the globe. Lady Warsi had called for action on Gaza via Twitter before her resignation. On 21 July, she Tweeted: "The killing of innocent civilians must stop. Need immediate ceasefire in #Gaza. Leadership required on both sides to stop this suffering." Three days later she added: "Can people stop trying to justify the killing of children. Whatever our politics there can never be justification, surely only regret #Gaza." In her first interview since her resignation, Lady Warsi told the Huffington Post: "The British government can only play a constructive role in solving the Middle East crisis if it is an honest broker, and at the moment I do not think it is." The British Foriegn Office is 'urgently investigating' claims that a British aid worker has been killed in Gaza, according to reports from British media. British Foreign Secretary Phillip Hammond called the rising death toll caused by the Gaza offensive “intolerable” and called for a long-term humanitarian ceasefire on both sides.